Open floating shelves in this Cleves kitchen keep dishware within easy reach. Open shelves offer an opportunity to add some style or unique character to the kitchen, but at their core, they provide a practical storage solution. Open shelving can be included anywhere, even in normally out-of-reach places. 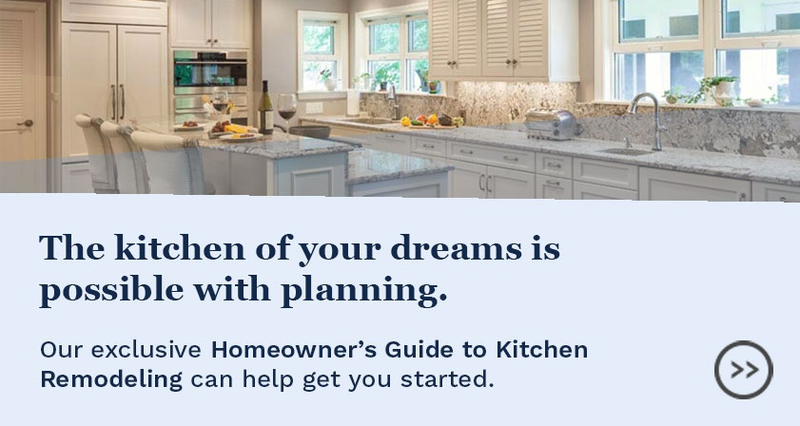 When considering open shelving in the kitchen, it's best to think about what you are most likely to want to use it for, then work backwards on how large the shelves should be, where they can be placed, and how many you will require. There are several options for the look and design of open shelves as well. 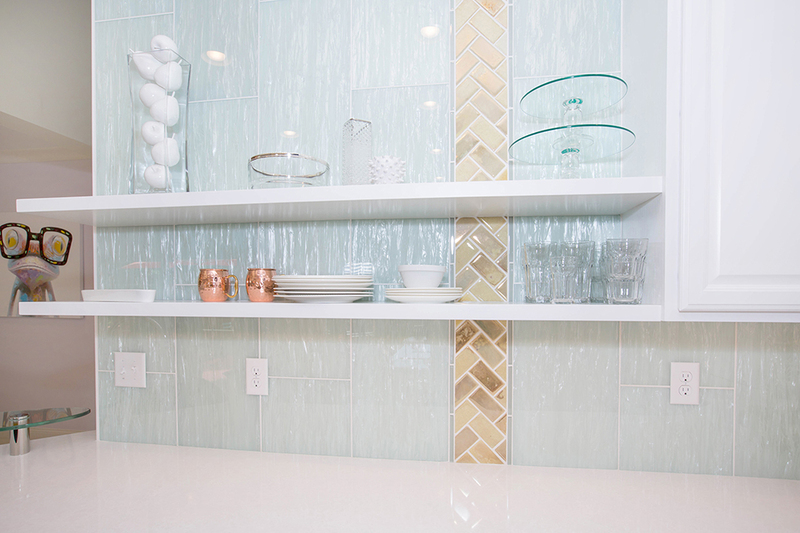 Floating shelves or industrial-looking shelves with brackets are trending options. Many cabinetry manufacturers also provide open cabinets that can be worked into the overall cabinet scheme for a more integrated look. 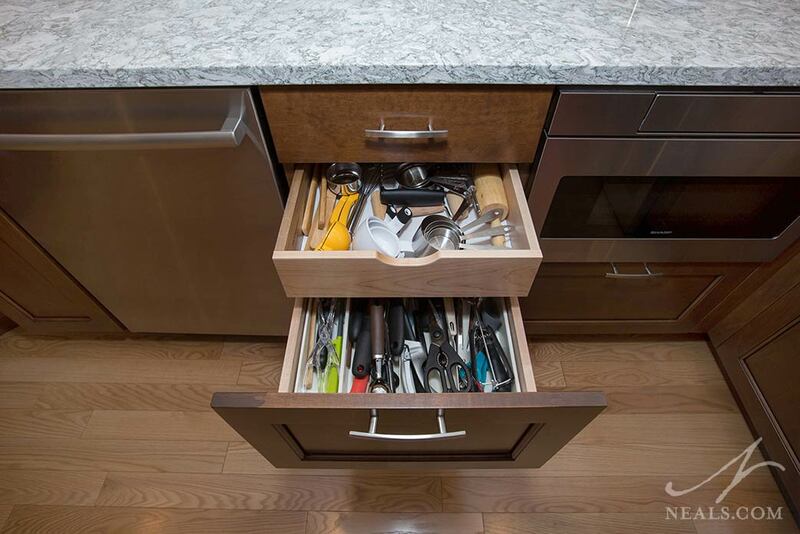 A drawer tray slides back to reveal even more storage capacity in this Montgomery kitchen. Cabinets now come with a remarkable array of interior features that increase the capacity and usefulness of the cabinet. Behind a single door, you may now find full-depth pull-out drawers, swing-out shelves that reveal additional storage space behind them, sliding racks for maximizing the depth of a drawer, and even simple stationary niches to keep items separated and properly corralled. 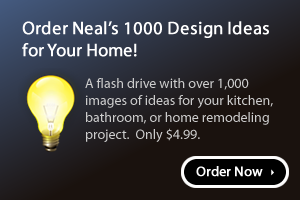 These types of cabinets are invaluable in kitchens that require a lot of storage in a little amount of space. Like all storage, it's important to start by getting a handle on the types, amounts, sizes, etc. of the items you need to store, then looking for the cabinet interiors that will allow you to store each category as efficiently as possible. 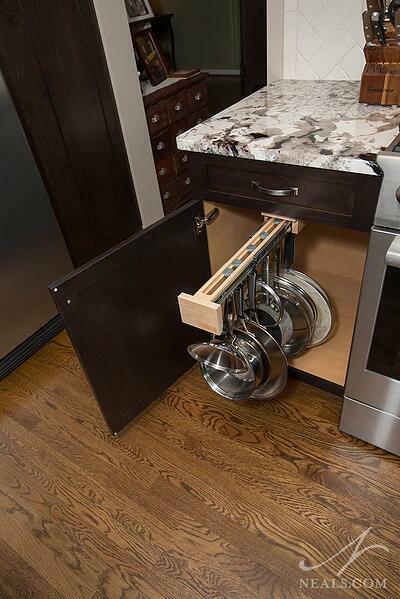 A slide-out rack for pans in this Loveland remodel makes storage easy and convenient. In addition to utilizing interior cabinet accessories that reduce wasted space, there are now many accessories on the market that help transform a cabinet interior into a specialty cabinet for a single or specific purpose. The easiest of these is a wine-rack, but there are also pull-out racks for pots and pans, or one of our favorites- a stand mixer pullout that saves your back from having to heft the mixer out when you need it. 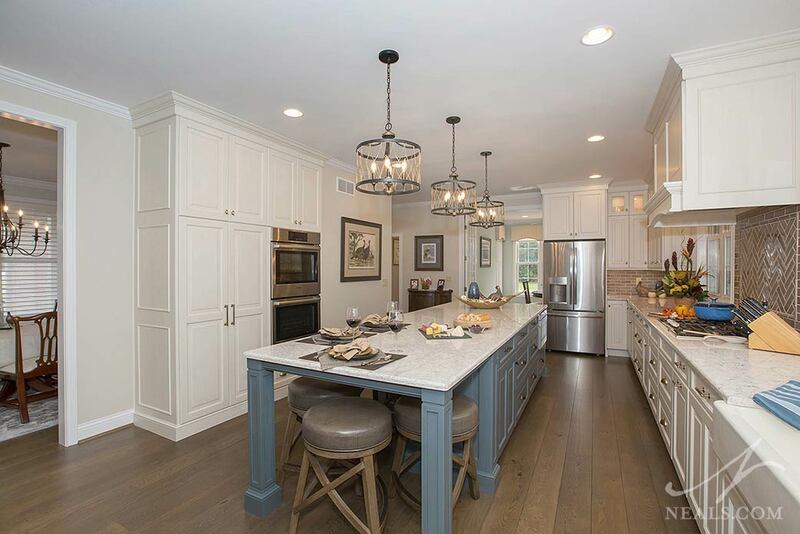 With cabinets on both sides and a seating area, the island in this Withamsville project doubles the kitchen's function. If your kitchen can accommodate an island, one great option for practical storage is to utilize all sides of this additional kitchen element. Long-term storage for items you won't need often can be placed in an island. The ends can hold shelves or shallow cabinets for spices or other smaller items. Think of the kitchen island as a second opportunity for storage, and you'll be surprised how far a few more cabinets there can go.